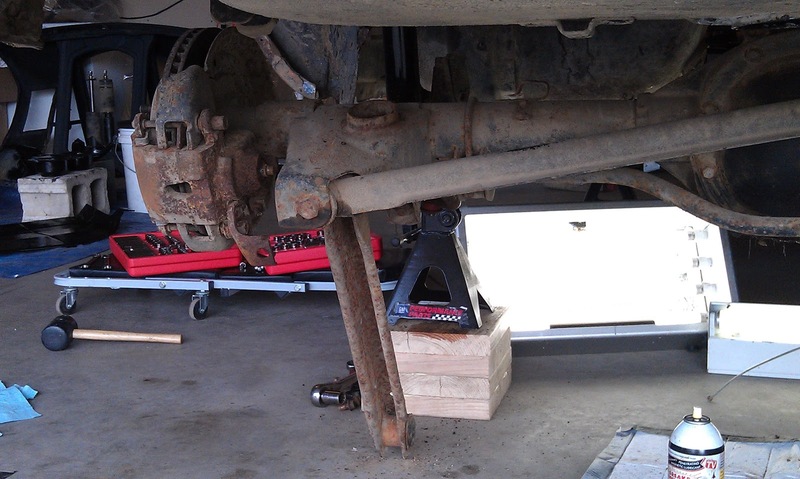 We were going to need the garage door open to work on the rear end. 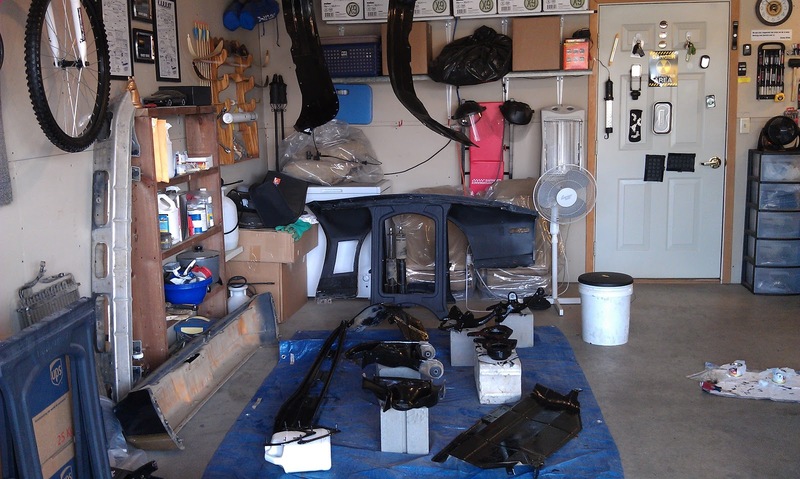 Once we had the garage door open we lowered the screen on the half of the garage that had the freshly painted parts. We hoped it would cut down on the dandelion seeds blowing in, and it did. 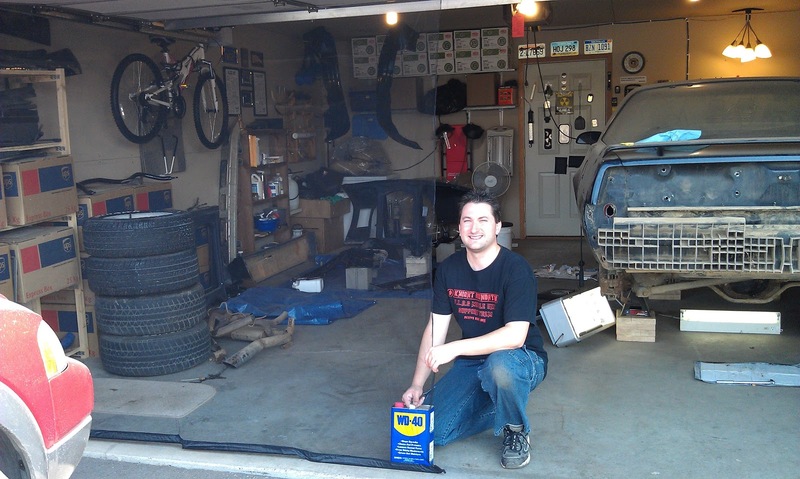 The WD-40 can is there to keep the bottom of the screen from blowing around. I usually use a cement block for this purpose, but it was part of Sara's Painting Station. 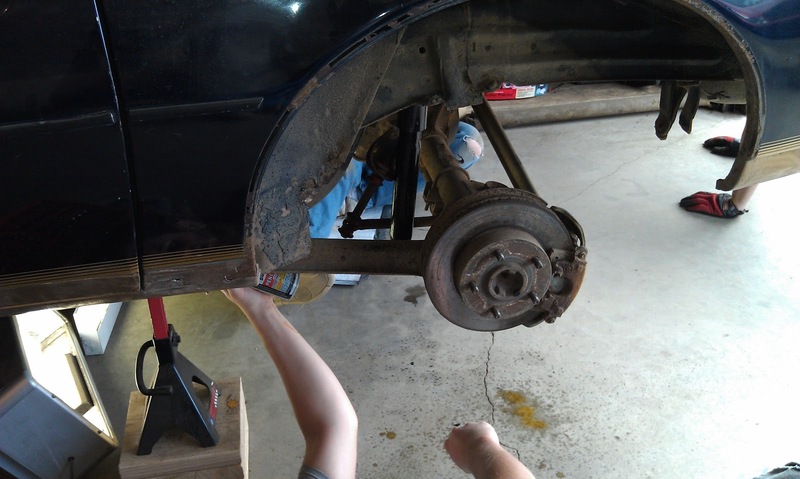 Since the rear springs were uncompressed already, we easily lifted the driver side spring out. 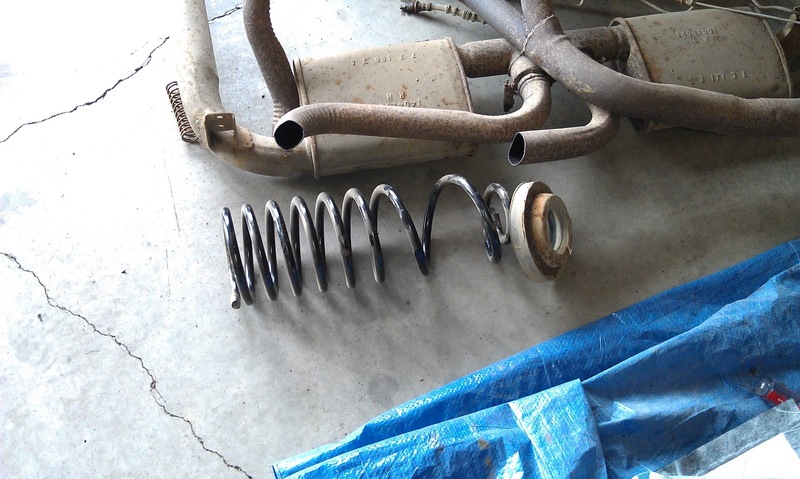 Driver side spring and cushion. 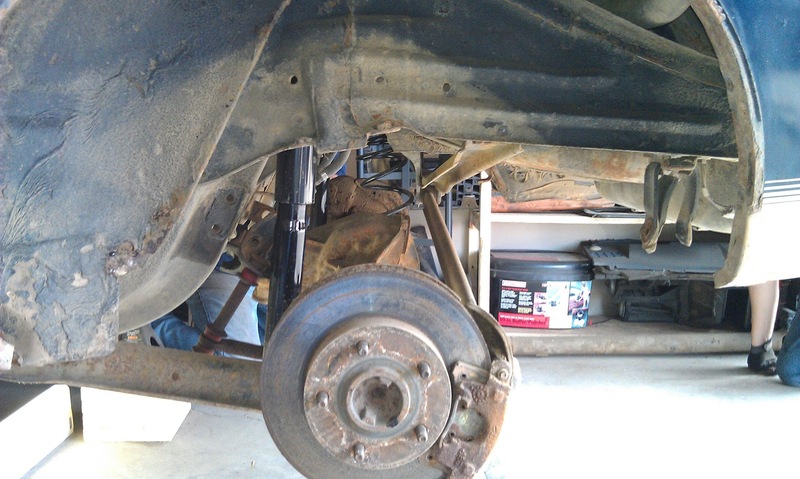 The next step was to unbolt the sway bar. 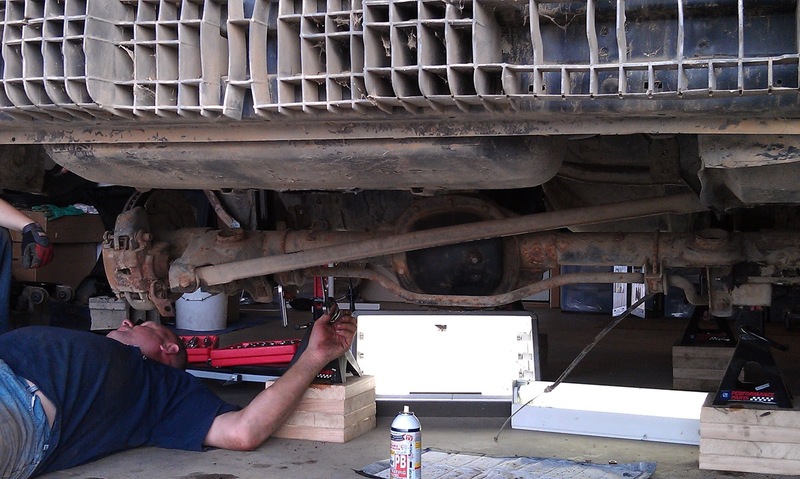 The bolts on the end link of the sway bar itself would not budge, so we decided to unbolt the bracket instead. 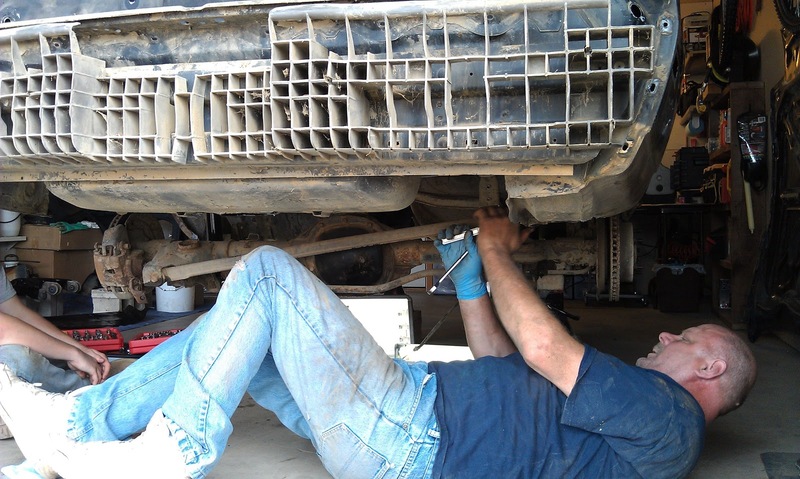 In this picture Troy is working on removing the bolts from the bracket. 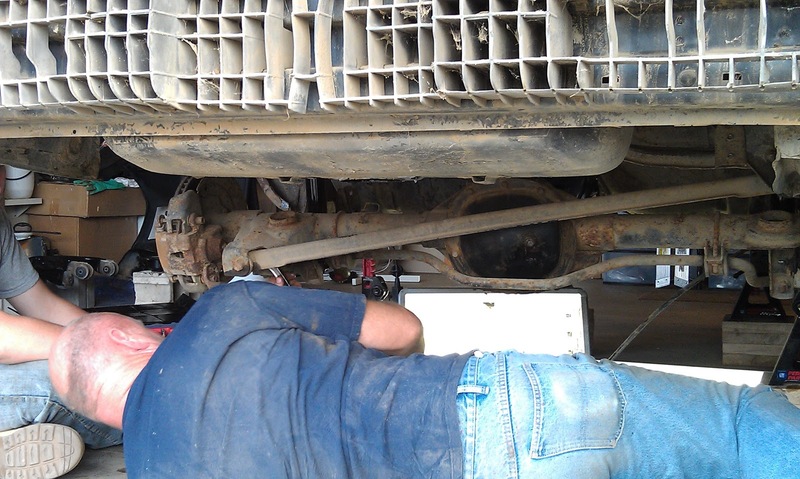 Troy examined the drive shaft I removed. He explained the proper way to clean, prep and paint it. 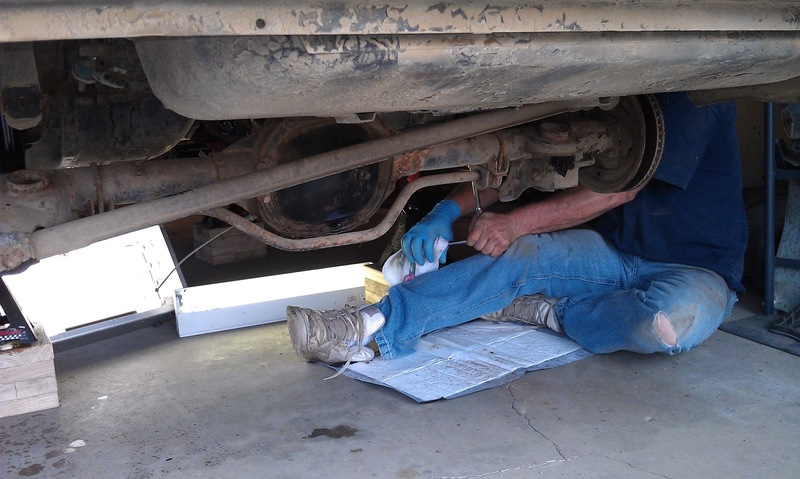 He said the drive shaft itself can be painted as long as the knuckles are kept free from paint. He also said when cleaning and painting to make sure not to knock any of the weights off. 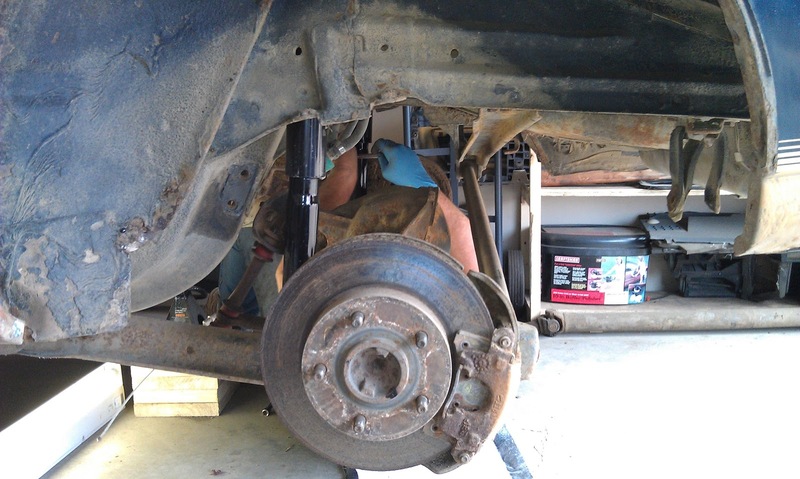 Troy easily pulled the passenger side spring out. 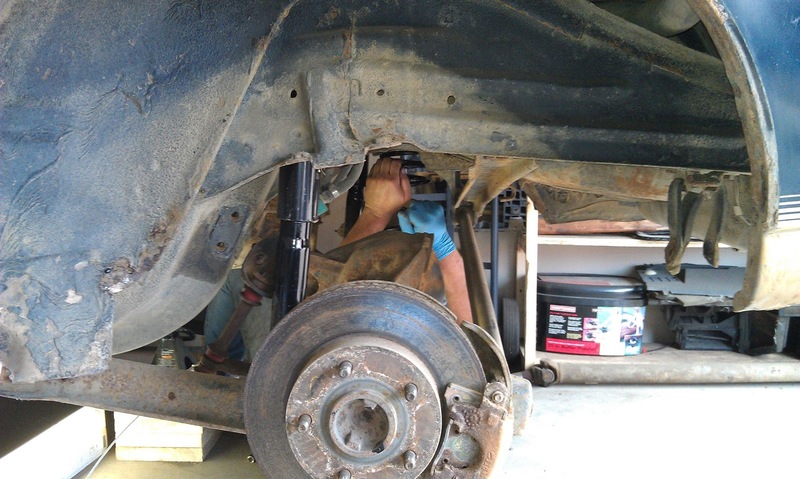 The rubber cushion for the passenger side spring was stuck so he just left it in place. 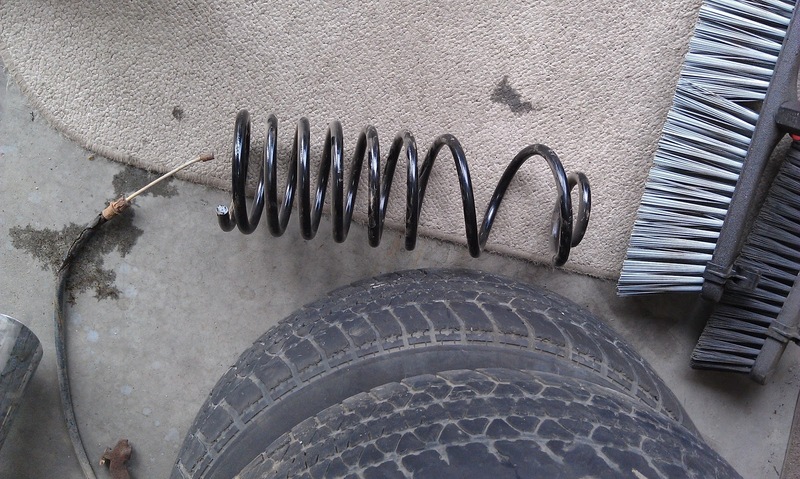 Here is the passenger side rear spring. 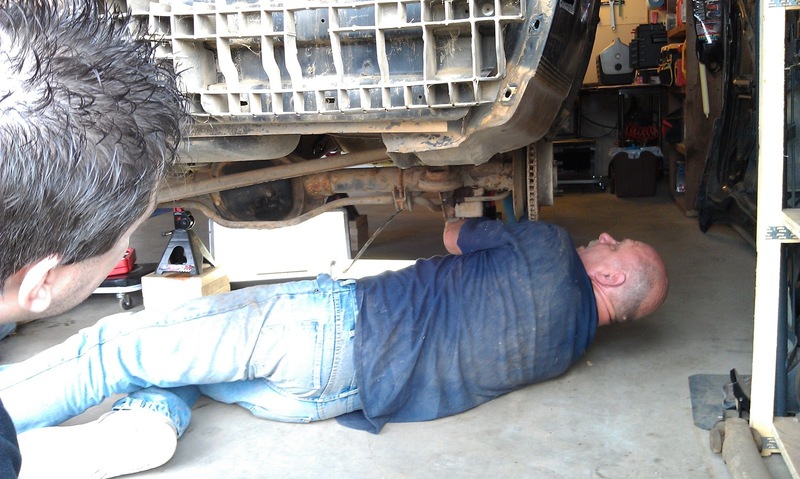 Troy's son came along to help drop the rear end. 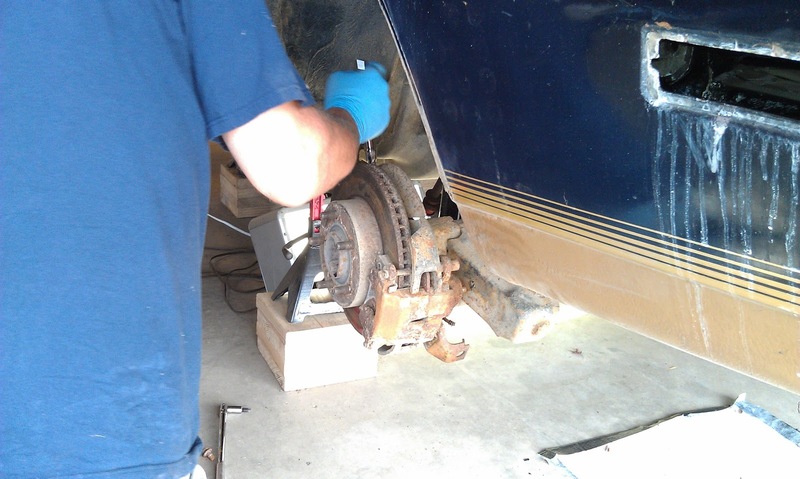 In this picture he is using PB Blaster to spray all of the bolts we plan to turn out. 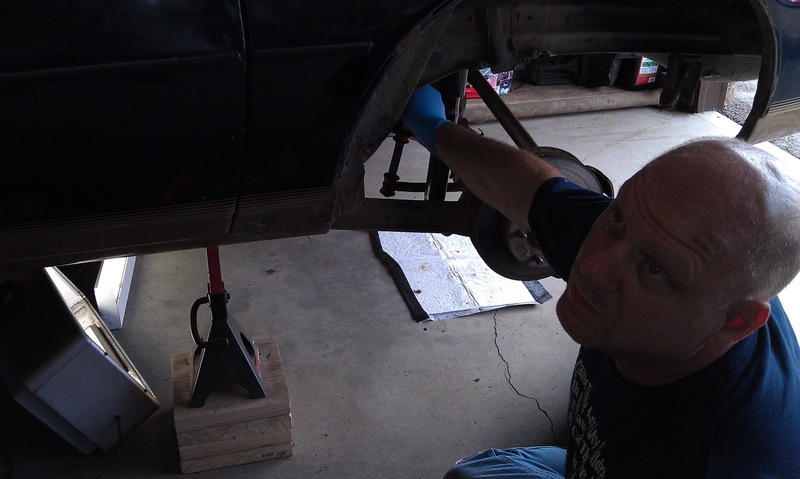 Troy was not able to get to the brackets for the passenger side sway bar, so he needed to work on loosening the end link up as much as possible to give himself some room. 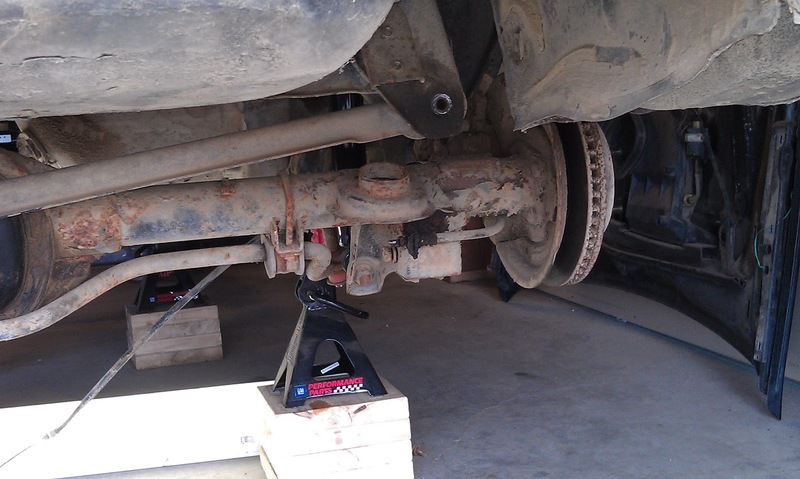 The sway bar bracket is free! 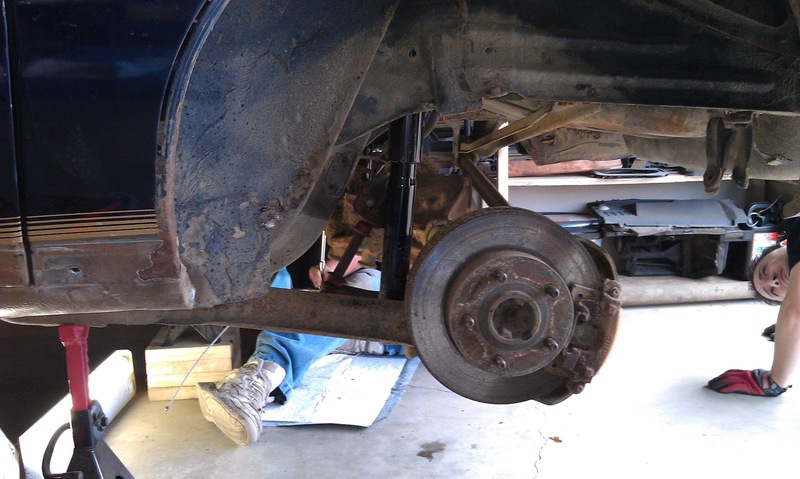 Time to move on to the Panhard bar. 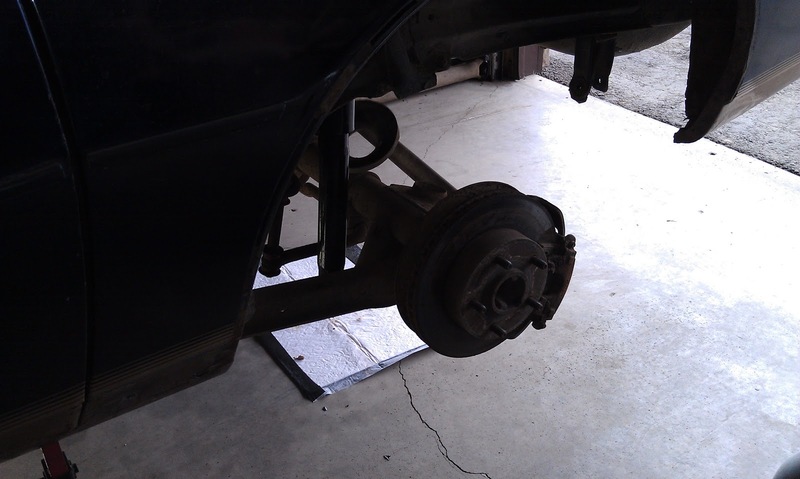 We removed the bolt mounted to the car frame. 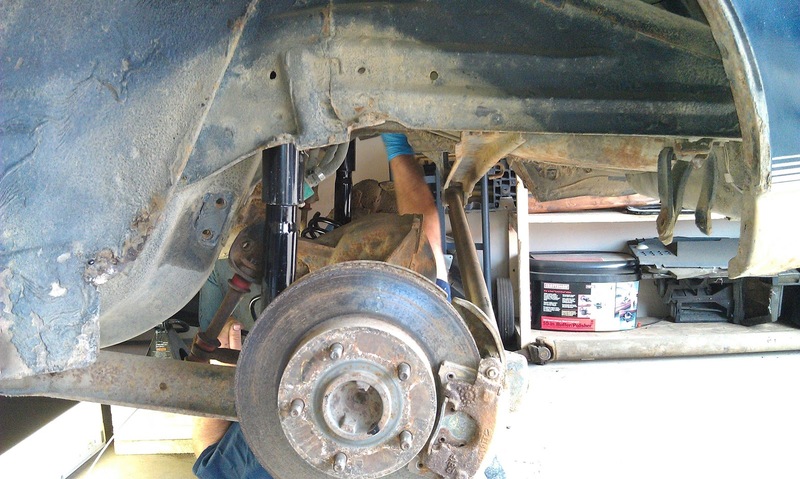 We decided to drop just the end mounted to the car frame. 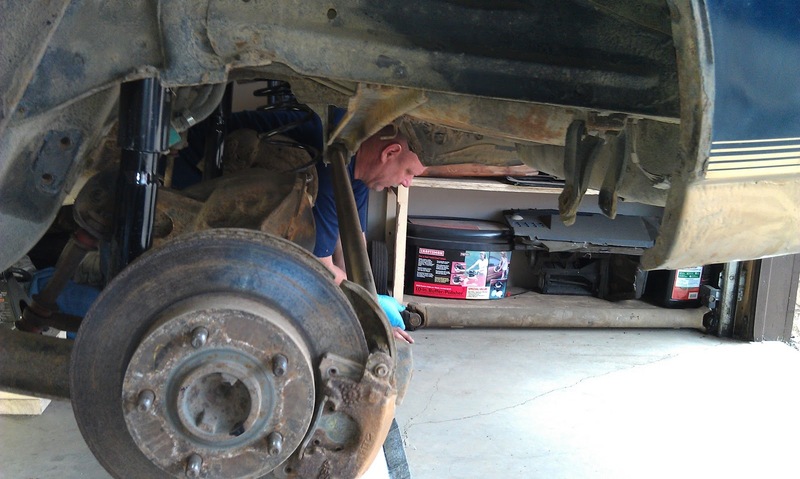 In these pictures Troy is unbolting and removing the control arms/trailing arms. 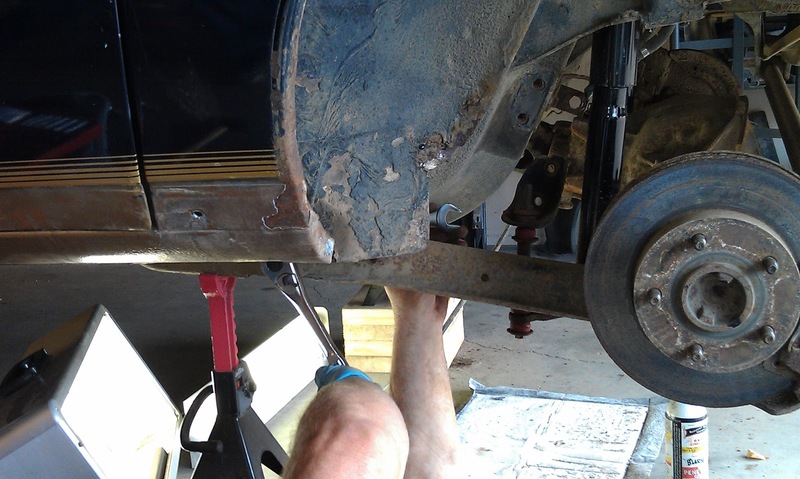 Driver side is disconnected from the car frame. 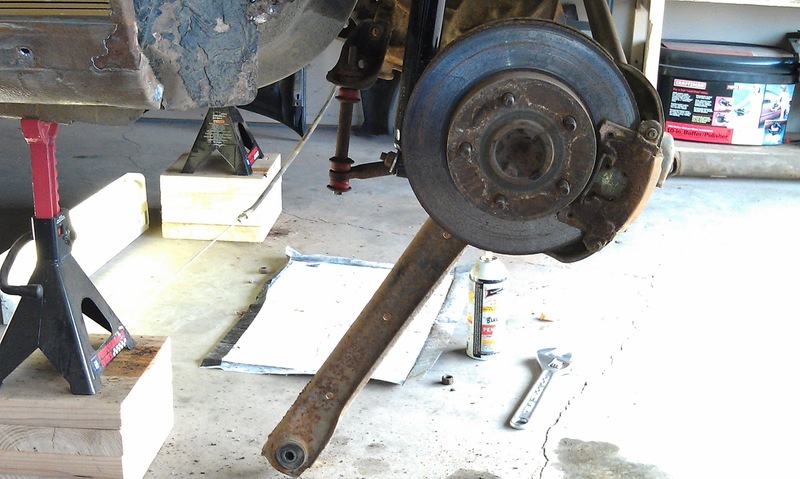 Passenger side control arm/trailing arm has been disconnected and removed. 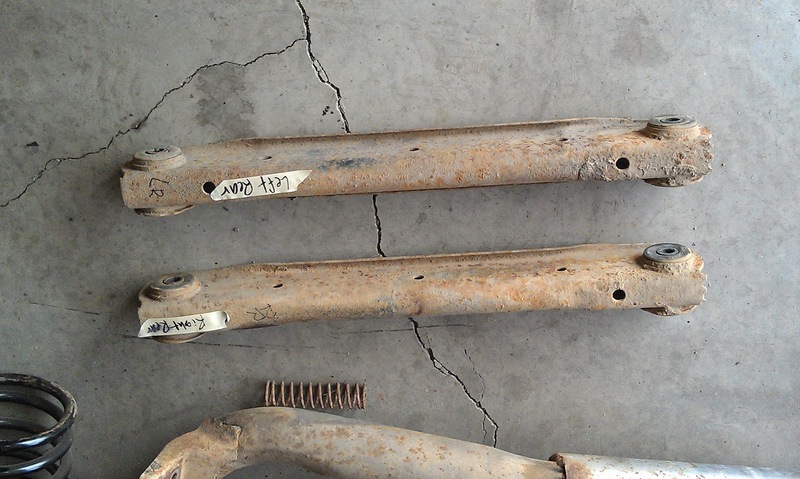 The control arms/trailing arms. Sara labeled them with a Sharpie and masking tape.